Open City is a book that moves through 3 continents (America, Europe, Africa), into the past and back, and touches all kinds of global and human themes - a lot of ponderings happens while the main character walks the streets of past-9/11 New York. It isn't the typical novel, it's more on the experimental side. while reading it, i looked for interviews with Teju Cole on the book - turns out, he lists his own favourite interviews on his website: Interviews. and there are about 360 Open City reviews up on Goodreads, reaching from 1 star to 5 star. while at Goodreads, i also saw that Open City was part of a "Book Tournament", and when following the book list and the link, i arrived at this book page i hadn't known of: The Morning News Tournament of Books, which is about the exact scene in Open City that got me looking for takes on it. the more i think of it, the stranger it feels that many critics ignored that key scene of accusation. it works like a second door to see things from a different, more provocative view: the main character, the one the reader learned to like and to sympathize (and maybe, in parts also identify with) in the first 80% of the book suddenly has a second face, a darker side. taking this one step further, and picking up a theme of the novel: the difficulty to deal with tragedy, and to bring it to awareness. there is a scene that is about slave graves in New York - and how the pain and drama of this time, and of 9/11 hasn't been fully acknowledged yet. so the reaction to the dark side: the way the main character blocks the memory of it, and then the majority of critics don't pick it up either, but leave it unmentioned - while others are upset that the author puts the main character through this - maybe that is beyond the fictional /personal reaction also reflection on our collected way of dealing with unsettling themes. it's one kaleidoscope of a book. "I knelt, and trailed my hand in the Hudson. It was frigid. Here we all were, ignoring that water, paying as little attention as possible to the pair of black eternities between which our little light intervened. Our debt, though, to that light: what of it? We owe ourselves our lives. This, about which we physicians say so much to our patients, about which so little can be reasonably be said, folds back and also asks us questions." '"But if you really learn how to pay attention, then you will know there are other options. ... Not that that mystical stuff is necessarily true. The only thing that's capital-T True is that you get to decide how you're gonna try to see it." (the full note, here: Truth, water, stone, and the direct essay link: This is water). 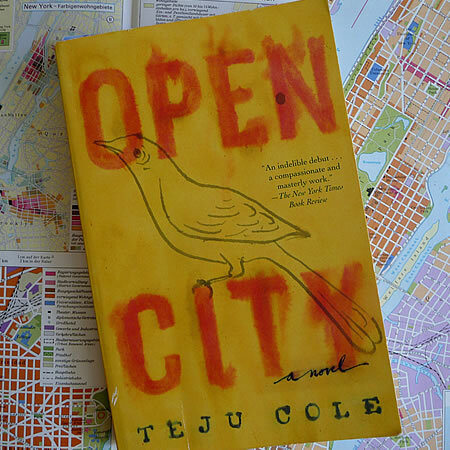 PS: thanks to Parmanu and Jean, it was Parmanu's blog entry on Open City and Jean's note on the book Open City opens here that made me go and list the book on my reading list. It is surprising to hear the meaning of the term "open city". I assumed it was less warlike too. This is a very thorough and insightful review, it makes me curious about the book.